The protest came two months after the jail was sued by Legal Services of Central New York, a public-defenders group whose suit alleges juvenile inmates are routinely kept in solitary confinement for interminable periods after committing minor offenses." 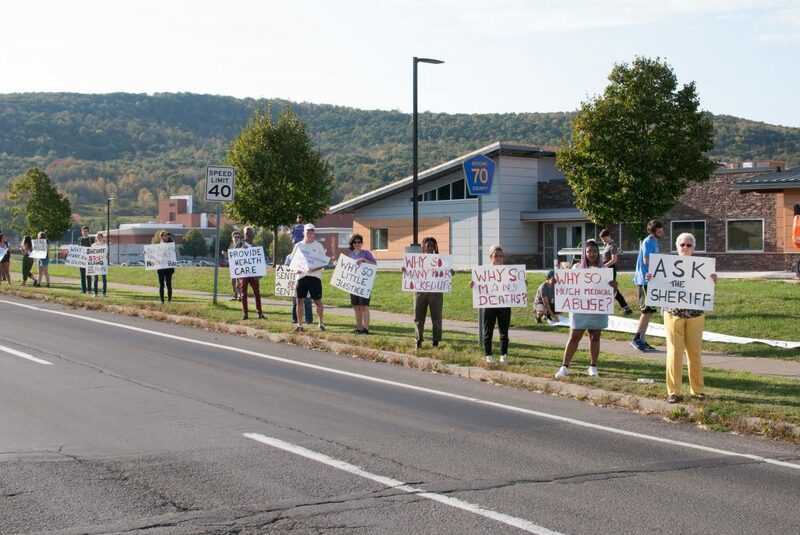 These were the messages on signs held by protesters on the corner of Front Street and Lt. Vanwinkle Drive in the Town of Dickinson on Wednesday evening, when roughly 40 community members and students rallied against what they said are inhumane conditions inside the Broome County Jail. “We found a really horrific spate of deaths that have occurred in the jail ― four deaths in the last six years; that’s about six times the normal rate for a jail this size,” said Andy Pragacz, a member of Justice and Unity for the Southern Tier and a sixth-year graduate student studying sociology. Binghamton resident Tinamarie Gunther, 43, said her husband was neglected, abused and beaten inside the jail. “I was told that my husband’s medical conditions were made up,” Gunther said. Less than a half-mile up the hill, outside the jail, a very different scene unfolded. In the parking lot, kids climbed in and out of military-style black humvees, watched K-9 dogs follow orders and tried on officers’ equipment before taking a tour of the jail with their parents. The jail’s open house, according to protesters, was a response to recent negative publicity the Broome County Sheriff’s Department has received. 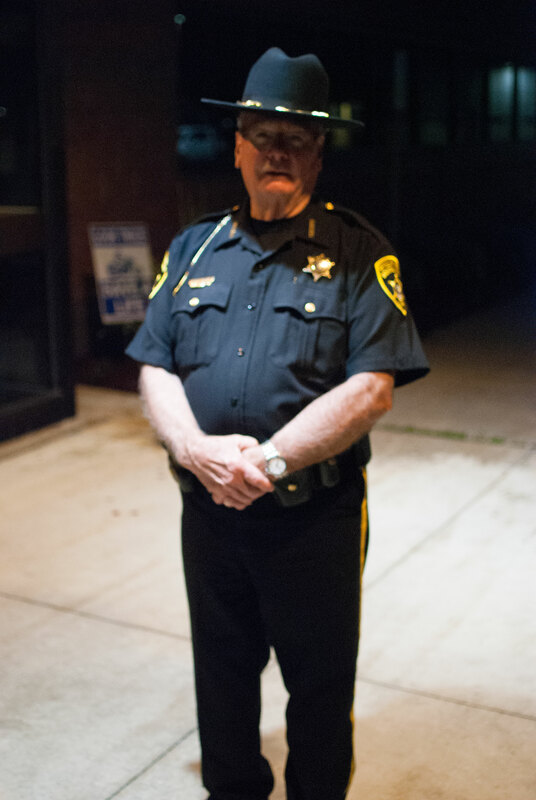 According to Broome County Sheriff David Harder, the jail has held an open house for 19 years — every year since he’s been in charge. The protest came two months after the jail was sued by Legal Services of Central New York, a public-defenders group whose suit alleges juvenile inmates are routinely kept in solitary confinement for interminable periods after committing minor offenses. 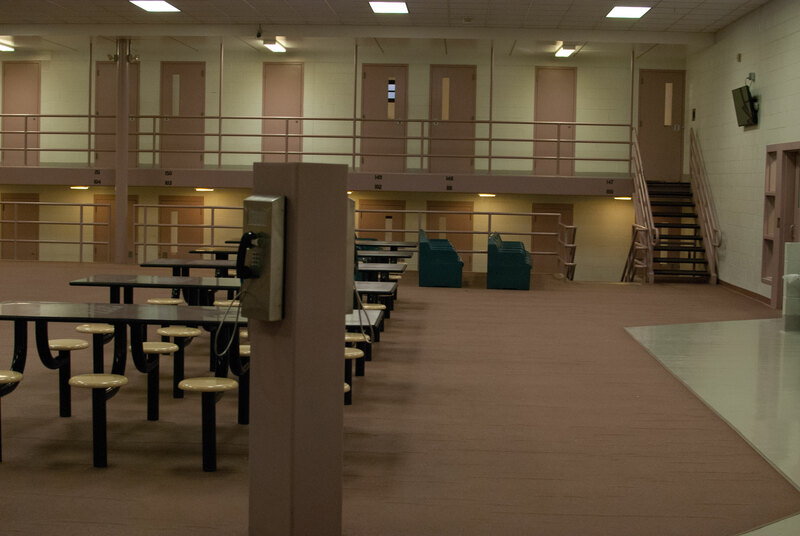 Harder said his corrections officers don’t use the term solitary, instead referring to the disciplinary unit as Delta Pod, and that inmates are usually placed there for fighting. A main concern of the protesters was the lack of adequate medical treatment to which they say inmates have access. Katie Smith, 24, of Binghamton was released from the facility in July and said she was denied a trip to the hospital after a fall in the shower left her with spinal cord damage. Karla Marte, a sophomore majoring in integrative neuroscience, attended the protest with the College Progressives. She said wants students to realize the problems of mass incarceration exist on the local level. Numerous protesters also noted what they called an inhumane bathroom situation for female inmates, in which they are visible to male corrections officers. Harder didn’t dispute this depiction of the bathroom facilities, saying it was necessary for the direct supervision structure of the jail. The Broome County Jail can house up to 600 inmates; 517 beds were occupied the morning of the open house and protest.